NEW ORLEANS – All-Region honorees for NCAA Division II Cross Country were recognized Monday by the U.S. Track & Field and Cross Country Coaches Association (USTFCCCA) following the weekend’s NCAA regional championships meets. A total of 398 student-athletes (200 men and 198 women) from 132 schools earned the distinction by finishing among the top 25 individual finishers at one of the eight regional sites across the country. 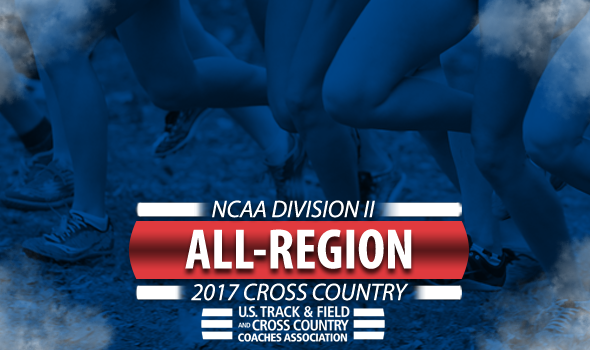 Three men’s teams were represented on the All-Region list by their entire varsity seven-runner squads: Midwest champion Grand Valley State, Southeast winner Mount Olive and South Central runner-up Colorado Mines. No women’s team accomplished that same feat, but Grand Valley State was one runner shy of doing so after picking up the Midwest Region title. When combining the two genders’ awards, Grand Valley State led the way with 13 total honorees. Edinboro and Colorado Mines each notched 11 honorees each, while Adams State and Mount Olive were the only other programs with double-digit honorees at 10 apiece. At the conference level, the PSAC and the RMAC tied for the lead with 41 All-Region athletes each. The Northeast-10 was right behind them with 39. The 2017 NCAA Division II Cross Country Championships will be held November 18 in Evansville, Indiana. A full list of the honorees can be found below. It is sorted alphabetically by team, and then in descending order based on athletes’ finishes at the regional championships. Only athletes from USTFCCCA member institutions are eligible for the award.